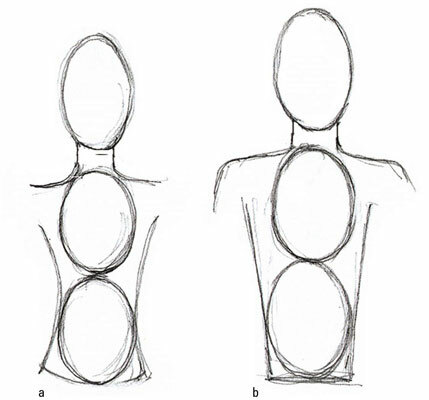 Waistlines come in all shapes and sizes, even in fashion drawing, but the basics remain: a woman’s waist is curvy, and a guy’s is relatively straight. Hips are wider and curvier on women and straighter and thinner for men. Hips are the widest part of your lower half. To draw a waistline, check the lines of proportion and use the head count to properly place the waist. Draw a figure and count down 3 heads. Draw a horizontal line for the waist. To shape the man’s waist, draw a line that starts in the armpit and angles down and in at the waist. For the woman, start the line at the armpit and create a line that curves in around the middle of the 3rd head and then flares out, creating an hourglass shape. Curve the line at the waist for a woman and keep the line straight but tapered in for a man. Using the head count, the pelvic area and hips fall within the 4th head down in your figure drawing. Hips serve a very important purpose, aside from the rocking and wiggling action they convey: the pelvic region is part of the body’s core. 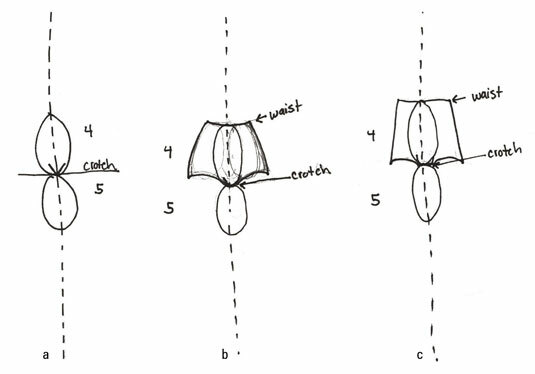 Starting at the bottom of the 4th head, draw a horizontal line for the crotch; place the V of the crotch on that line. At the top of the 4th head, draw a curved line for the waist. Starting from the sides of the waistline, draw the sides of the lower torso: Use a line down each side, ending at the horizontal line for the crotch. Draw a couple of downward arcs to represent the tops of the legs. In women, the hips are often just a little wider than shoulder width. A man’s hips tend to be narrower than his shoulders. The entire hip and waist area is boxier on a guy — his waist is just slightly narrower than his hips.